The offer is for access to analysis and selections for all the major races over the 4 days of the Cheltenham Festival plus the bonus that isn't available anywhere else is immediate access to all the regular selections of the tipster from now until the end of March. The tipster in question has made 29.85 over the last 2 festivals. So that's 29.85 points profit in 8 days of racing. Or £298.50 profit to £10 stakes. 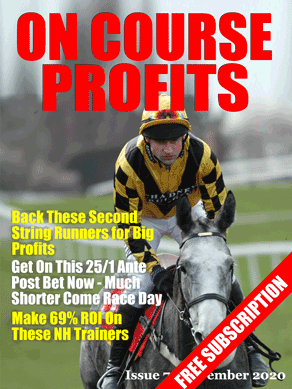 The regular price of the tipping service that you will be getting 5 weeks free access to is £29.97, but the price for Cheltenham access plus all of March and the rest of February is just £19.99. As part of the Cheltenham service you will also get a copy of the 50 page pdf outlining all the key trends for the festival.